Once the vigilante known as Black Lightning, high-school principal Jefferson Pierce comes out of retirement when a new gang called The 100 threaten his community and his daughters. The Black Lightning comics of Tony Isabella, Black Lighting Year One, the Outsiders comics of Judd Winick and the JSA comics of Geoff Johns. It seems unlikely that the police wouldn't notice Black Lightning posing dramatically next to the neon sign overlooking the crime scene. This is not quite as unlikely, however, as Jefferson Pierce hanging around in the first place. Cress Williams nails the part of Jefferson Pierce, portraying the character's sensitive nature but also his toughness. James Remar doesn't have much screen time as Peter Gambi, but he steals what few scenes he has. Likewise, Marvin "Krondon" Jones III doesn't have much time on screen as Tobias Whale, but he is quite intimidating from what little we see of him. The effects work for the various electrical effects is well-played. The Black Lightning costume looks fantastic. And to other men fear! This poem opens the episode, quoted by Jennifer Pierce. It was written by Tony Isabella for the first Black Lightning comic, paraphrased from a poem by Thomas Randolph. It was written by a young Jefferson Pierce in the comics. The 100 were first introduced in Superman's Girl Friend Lois Lane #105 (October 1970) and created by Gerry Conway and Curt Swan. Originally founded in Aragon, Spain in 1462, a group of 71 men and women from around Europe dubbed themselves El Ciento in honor of themselves and their 29 fallen comrades. The group discovered a means of magically extending their lives that required them to draw upon the suffering of people who lived on land that they owned. This led to them scattering around the globe and building their own places of power. One of them settled in the Suicide Slum neighborhood of Metropolis and developed the local gangs into a syndicate under their control, which was also dubbed the 100. This Metropolis gang came to be run by a man named Tobias Whale. The character of Inspector Henderson was first introduced into the 1940's Superman radio show, as a police man who was Superman's contact with the Metropolis Police Department. He was formally introduced into the comics in Action Comics #442 (December 1974) and was created by Elliot S! Maggin and Curt Swan. Given the full name of William Henderson, the Inspector appeared in the original Black Lightning comics as a foil for Black Lightning, determined to bring the vigilante to justice when it appeared that Black Lightning had killed one of the criminals that he fought in his first major case. His opinion on the hero softened, however, when Black Lightning saved him from crime-boss Tobias Whale and Henderson determined that Black Lightning was innocent. Later comics depicted William Henderson as the Police Commissioner of Metropolis. The TV series version of Inspector Henderson is described as a 23-year veteran of the Freeland Police Department. He is black whereas the Inspector Henderson in the comics was white. He appears to have a similarly adversarial relationship with Black Lightning as the series opens. Jefferson Pierce aka Black Lightning first appeared in Black Lightning #1 (April 1977) and was created by Tony Isabella and Trevor Von Eeden. A former Gold-Medal winning decathlon star, Pierce went to college to become a teacher and returned home to the Metropolis neighborhood called Suicide Slum to teach at Garfield High - the inner-city high school he'd attended as a teenager. He ran afoul of a gang called The 100 after running a drug dealer out of his school with the aid of a star athlete pupil. Later that night, the 100 killed the pupil as a message to Pierce. Pierce got the message, and elected to deliver one of his own. Donning a costume made by his foster father, a local tailor named Peter Gambi, Jefferson began fighting The 100 and everyone else who threatened his school as Black Lightning. Historically, Black Lightning was an important character in several respects. He was the first black superhero to headline his own series at DC Comics. He was also, by design, the first black superhero born of a professional background. Isabella had a hand in developing other black heroes at Marvel Comics and noted, with dismay, that the only black characters children had to look up to in superhero books were either African royalty (ala Black Panther, Storm) or street-wise characters inspired by Blaxploitation movies (Misty Knight, Luke Cage, The Falcon) with nothing in between. In the original comics, Jefferson Pierce was an ordinary human albeit one in peak physical condition due to his training as a Gold Medal-wining Olympic decathlon star rather than a meta-human. His powers originally came from a special belt, which generated an electric force-field that deflected bullets and allowed Jefferson to run a charge through metal objects by touching them. The belt was later determined to have activated Jefferson's metagene, which gave him full electrical generation and manipulation powers. Later retcons eliminated the belt and had Jefferson always having been a metahuman with electric powers. We find out that Jefferson Pierce is the principal of Garfield High School in Freeland. In the original Black Lighting comics, Jefferson Pierce was a teacher at Garfield High School. The TV series version of Jefferson Pierce is also a former Olympic Gold winner. We are not told what sport he won it for, however. Anissa Pierce first appeared in Outsiders #1 (August 2003) and was created by Judd Winick and Tom Raney. The never-before-mentioned eldest daughter of Jefferson Pierce, she was a metahuman with the power to control the density of her body. This made her super-strong and invulnerable and also allowed her to create sonic waves by stomping the ground. This led to her superhero codename, Thunder. She made a deal with her father, who did not want her following in his footsteps, that she could become a superhero, if she wanted, after she graduated from college. She donned her first costume and went on her first patrol the night of her gradation. The TV series version of Anissa Pierce is said to be a medical school student who teaches health studies three days a week at Garfield High. In the original comics, Anissa Pierce was a fully qualified medical doctor. At the end of the episode, she is depicted as having the super-strength of her comic-book counterpart, accidentally breaking a ceramic sink while having a panic attack thinking about the events of the past few days. Jennifer Pierce first appeared in Justice Society of America #12 (March 2008) and was created by Geoff Johns and Dale Eaglesham, though her look was based on a character from the 1997 mini-series Kingdom Come by Mark Waid and Alex Ross, who was said to be a future daughter of Black Lightning. The youngest daughter of Jefferson Pierce, she inherited her father's powers to manipulate electricity. Wishing to avoid the mistakes that he made with Anissa, Jefferson placed Jennifer in the care of the Justice Society of America, trusting them to oversee his daughter's training in controlling her powers. She took the code-name Lightning, despite being fearful of her sister's reaction. The TV series version of Jennifer Pierce is still in high-school. She is said to be an outstanding scholar-athlete, much like her father. Until Outsiders #1, it had never been suggested in any story that Jefferson Pierce had children. The idea did not please Black Lightning creator Tony Isabella, who maintained that a man of Jefferson Pierce's moral character would have tried to work things out with his wife for the sake of the children rather than seek a divorce. Isabella also said that Jefferson Pierce would never have taken up the life of a vigilante in the first place if there was any chance he'd leave orphans behind. This was one of many clashes Tony Isabella would have with writer Judd Winick, who also introduced Black Lightning's niece into a Green Arrow storyline despite Jefferson Pierce having been an only child! Winick also depicted Jefferson Pierce using his powers to commit an act of cold-blooded murder, striking down the corrupt executive responsible for killing his niece with a freak lightning bolt at the end of the same storyline, despite Jefferson Pierce being a man of such strict moral character that he retired from crime-fighting when he thought he could no longer use his powers safely. The story was later retconned so that while Jefferson did strike the man, the bolt he used was non-lethal but his death was facilitated by Deathstroke, who just happened to be there and just happened to decide to mess with Black Lightning and make him think that he'd killed. For some reason. Jennifer Pierce says that Thunder and Lightning were a witness to her father's rebirth as Black Lightning. In the comics, Anissa and Jennifer Pierce used the codenames Thunder and Lightning when they became superheroes. Lady Eve first appeared in Batman And The Outsiders #24 (August 1985) and was created by Mike W. Barr and Alan Davis. A member of the Kobra cult, she served as the sinister cult-leader's lover and right-hand. The TV series version of Lady Eve is introduced as Ms. Lady Eve and owner of the Black Bird Funeral Parlor. In the original Tony Isabella Black Lightning comics, Lynn Stewart was Jefferson Pierce's ex-wife. This is also the case in the TV series, but the reason for their divorce is quite different. In the comics, the two divorced long before Jefferson Pierce became Black Lightning. In the TV series, Lynn Stewart left Jefferson because of his life as Black Lightning. Curiously, in the comics, Lynn Stewart figured out that Jefferson Pierce was Black Lightning but she approved of what he was doing rather than condemning it, as she does on the TV series. Peter Gambi first appeared in Black Lightning #1 (April 1977) and was created by Tony Isabella and Trevor Von Eeden. A tailor who ran the store under the apartment in which Jefferson Pierce and his mother lived following the death of Jefferson's father, Gambi became a second father to a young Jefferson. When Jefferson sought help in finding a way to strike back at The 100 after the death of one of his students, it was Gambi who designed the Black Lightning costume for Jefferson and acquired his special power belt that was designed by associates of his brother. Peter Gambi's brother, it should be noted, was Paul Gambi. In the comics, Paul Gambi was a tailor in Central City who designed costumes for super-villains as a side-business. The Rogues Gallery were his most frequent customers and treated Gambi like a member of their extended family, never telling the police who it was that provided them with the specialty clothing they often required. In the comics, it was revealed that Peter Gambi was the trigger-man who accidentally killed Jefferson Pierce's father, Alvin, who ran a small grocery store. The incident scared him straight, and he opened his tailor shop and made Jefferson's mother a partner in his business as a means of atoning for his past crimes. He finally sacrificed himself to save Jefferson's life from an attack by the villain Syonide. The TV series version of Peter Gambi is also a tailor and says that he thinks of Jefferson Pierce as a son, having known him since he was 12. The TV series version of Alvin Pierce, Jefferson's father, is revealed to have been an investigative journalist. This was the background given to Alvin Pierce in the Black Lighting: Year One mini-series. Jefferson says that his father was killed by the gangster Tobias Whale, literally having an article about Whale's crimes shoved down his throat until he died. Tobias Whale first appeared in Black Lightning #1 (April 1977) and was created by Tony Isabella and Trevor Von Eeden. An albino African-American of considerable girth, Tobias Whale was often called "The Great White Whale" behind his back. As leader of the Metropolis branch of The 100, Whale was the closest thing Jefferson Pierce had to an arch-enemy and the two would fight many times over the years. He had no super-powers beyond heavily developed muscles. The TV series version of Tobias Whale is a crime boss who leads The 100 and he is an albino. He has a miniature harpoon with which he shoots people he wishes to torture but not kill. He is not morbidly obese nor does he seem to have super-strength. The costume we see Black Lighting wearing in the security camera footage on the news report where the shop owner talks about how Black Lighting saved his life appears to be based on the character's costume design in the animated Young Justice cartoon. The new Black Lighting costume appears to be bullet-proof. Though not identified by name in this episode, the two minions of Tobias Whale who pick up Lala are Synoide and Joey Toledo. In Black Lighting #1, Joey Toledo was the operative with The 100 who was responsible for killing one of Jefferson Pierce's students, inspiring him to become Black Lightning. The name Syonide was used by three confirmed different villains. It is possible there was a fourth Syonide as well, but we'll get to that. The first Synoide appeared in Black Lightning #3 (July 1977) and was created by Tony Isabella and Trevor Von Eeden. A master hunter and brewer of poisons, he was hired by Tobias Whale to capture Black Lightning. He succeeded but balked upon learning that he was expected to kill the hero as well. Fearful of opposing the will of The 100, he attempted to do the job using a gun that poisoned him as he fired that shot that would kill Black Lightining - a shot that was taken by Peter Gambi instead in Black Lightning #7 (November 1977). The second Syonide was created by Mike W. Barr and Jim Aparo and first appeared in Batman And The Outsiders #19 (March 1985) This Syonide was a woman and every bit the vicious killer the first one wasn't. Given the equipment of the original Syonide, which included a special gun that shot poisoned bullets or stun rounds and an electrified whip, she worked for Tobias Whale as a bodyguard and assassin. Her real name was never given. The third Syonide was a woman named Nikki, who first appeared in Outsiders #16 (March 1995) and was created by Mike W. Barr and Paul Pelletier. She was part of the all-female Strike Force Kobra, run by Lady Eve. She was depicted as the lover of Fauna Faust - the sorceress daughter of JLA baddie Felix Faust. This Syonide died in the same issue where she made her first appearance, seemingly strangled with her own whip by The Eradicator. Curiously, a woman called Syonide was seen in Action Comics #817 (September 2004) among the many villains trying to take down a weakened Supeman. This Syonide wore the leotard-style costume of the second Syonide but had the shorter hair of the third Syonide. It is possible, but was never confirmed, that this was a fourth Syonide. Strangely enough, a version of Syonide who seemed to be the third one appeared in Firestorm #17 (November 2005) as part of a team including Black Adam, Queen Bee, The Royal Flush Gang and The Parasite. She is addressed as Nikki at one point, but no explanation is given for her apparent survival. It seems likely that her girlfriend may have resurrected her somehow, but this was never officially explained and she never appeared again after this story. It is too soon to say which version of Syonide the TV series version is most closely modeled on. We see that Black Lightning has the power to drain electricity from nearby electrical objects, killing a police car's battery and disrupting the power at Club 100, knocking out most of the dance-floor lights and the sound system while causing the safety lights to flicker. We also see Black Lightning shoot lighting bolts and add an electric charge to his punches. Black Lightning is immune to the effects of tasers. He can absorb the electrical charge from one and redirect it back to the person holding the taser. Black Lightning is capable of discharging enough static electricity to make a car explode. Black Lighting is capable of lifting a human body electromagnetically. We see him do this as he is questioning Will on the whereabouts of Lala. Jennifer: This was the night, in the rain, with Thunder and Lightning as a witness, that Black Lightning was born again. Kiesha: Ain't nobody got time to be waiting on the Queen of Garfield High. Jennifer: Kiesha, stop calling me that. Kiesha: What?! Girl, embrace it! It's true! Jennifer: Yeah, but when people say it they're just low-key hating on me for something I can't control. Like, my dad's the principal. I get it! Henderson: You should start a church, Jefferson. At least you would make more money. Lynn: Heard your daughter got arrested tonight. It's not a good look, Jeff. Jefferson: My daughter? Oh, you're funny. Yeah, we have joint-custody, which means half of her attitude is your responsibility. Lynn: Jeff, Anissa has not been in "our custody" for quite some time now. Now, I know it's hard for you to swallow but she's not a child anymore. She's a grown woman. Jefferson: Yeah, legally true. But emotionally and financially, she is still in my care. And always in my wallet. Peter: Do you remember why you became Black Lighting? You wanted to give the people hope. You wanted the evil that's out there to have something to fear. Right now there's nothing to fear and evil's running rampant like a plague through this city... hell, through this world! Jefferson: Okay. You know what? Let's cut through the poetry and just talk real. Now, the purpose of Black Lightning was to kill Tobias for literally shoving my father's article down his throat until he died. Then it was because of crime bosses! Crooked politicians! Every small-time street-thug that had snatched a purse or robbed a store! You see, there's no end, Gambi! There's no bottom for Black Lightning... and the only loser in all of it is me! Store Owner: When you're staring down the barrel of a gun, you don't care if the person saving you is a Christian, Muslim, Jew, black or white or some guy in a weird Parliament Funkdaelic get-up. You just want to be saved! Black Lightning: Now you should at least give a brother a moment to say something heroically clever. Now you've just pissed me off. Inspector Henderson is described as a 23-year veteran of the Freeland Police Department, who came up through the ranks fighting Black Lightning. 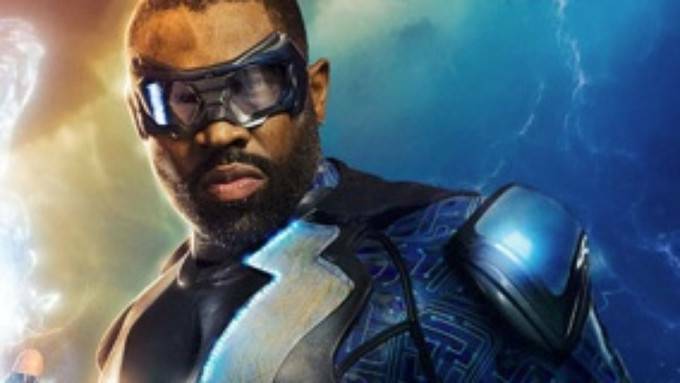 As the series opens, Black Lightning has not been seen for nine years. Anissa Pierce is arrested for civil disobedience after attending a protest of The 100 gang that turned violent. She is politically active and criticizes her father for not being more involved in the community outside of his job. Jennifer Pierce is a star track athlete and scholar, though she longs to get out from under her controlling father's thumb. Jefferson Pierce is pulled over on suspicion of being the suspect of a liquor store robbery, despite wearing a suit and tie. This is, he notes, the third time in the past month he'd been pulled over. Jefferson Pierce has a friendly relationship with Inspector Henderson in his secret identity. Henderson promises to look into the cops who pulled him over and used his influence to get Anissa released early. Club 100 is a Freeland club frequented by gang members. It is run by a man called Lala, who is part of The 100. The 100 run a brothel through a motel called The Seahorse Motel. Jefferson Pierce has been principal of Garfield High for seven years. They have not had one incident of violence in all that time and have a 90% graduation rate. Jefferson Pierce had approached various gang leaders in Freeland about keeping the peace around the school. That apparently comes to an end when he approaches Lala about keeping his man Will (who is his cousin) away from his daughters after Will shows up at the school trying to hook-up with Jennifer. Lala's real name is Latavious. He was one of Jefferson Pierce's students. Lala has been running his territory for The 100 for five years. At the end of the episode, Annisa Pierce breaks a sink with her bare hands. Jennifer's sneaking out to go to a club that is a popular gang hang-out spurs her father into action to save her. This, coupled with Annisa and Jennifer being taken hostage by The 100, leads to his becoming Black Lighting again. Jefferson uses a criminal as a human shield to block the gunfire of another 100 member. While this isn't quite the same as shooting them himself, it's still something hard to imagine the classic Black Lightning doing. The idea of Jefferson Pierce trying to balance being a vigilante when he has kids at home flies in the face of everything Tony Isabella's take on the character preached about personal responsibility. Shockingly good, pun very much intended. Overall, this is a solid pilot episode that does a fantastic job of drawing upon the various conflicting mythologies of the character to build something solid for modern audiences. Though the purist in me rankles on a few points here and there, as a comic fan I found it most entertaining and plan to keep watching it.